St. John's Wort oil is very appreciated in folk medicine and it is proven to help in the treatment of burns, wounds, and various skin diseases, but its medicinal ingredients help in solving many other health problems. St. John's Wort has a Latin name Hypericum Perioratum, and people know it better as the lady's flower, St. John's wort, St. Ivana’s grass or Goat weed. This is a perennial weed plant, from which we can get a valuable medicinal oil. Thanks to its beneficial properties St. John's Wort is widespread. The flowers are full of oil that have their colour due to hypericin. In the following text, we will go into greater detail on all the ways the oil from this herb can be used and how it works on our body. For what is St. John's Wort oil good for? Today is St. John's wort oil is known for its exceptional antiviral and antibacterial effects, and thanks to its anti-inflammatory effects it is used for wounds and burns. It has many applications in the duodenal and stomach as well as in disorders of digestion, stimulation of the secretion of gastric juices. St. John's Wort oil for internal use prevents cramps, eases bloating. It is used as a pain relief in gastritis. In recent times it is becoming increasingly popular as a means of combating depression, there are numerous scientific studies that have confirmed this. Most commonly it is applied with mild depressions. It is used with fears, anxiety disorders, and mood disorders in menopause, seasonal depression that occurs most often during the winter months. How healing effects of St. John's wort are strong shows us the fact that its application has shown effective with people suffering from HIV virus. It is noteworthy that it helps with various vaginal infections, inflammation of the mucous membranes, as well as in the presence of haemorrhoids (internal and external) as well as varicose veins. St. John's Wort oil against Candida is very successful in the long-term treatment of this persistent fungus. It is used with sudden mood swings in menopause, as well as nocturnal enuresis. Medicinal St. John's Wort oil is not the only product of this plant that we can use, there is a soothing tea from this herb. Drink a cup of tea and turn your mind off to everyday problems, it will help you relax and fall asleep more easily. The skin is the most problematic and on it various esthetical problems, especially irregularities such as acne, pimples, various types of eczema and rashes may occur. A number of these imperfections are due to the presence of microorganisms contained in it. If you regularly use the soothing St. John's Wort oil for your face, your skin will very quickly become smooth and healthy, with no signs of irregularities. In addition to acne, rashes and pimples on the face, St. John's Wort oil very effectively helps in the treatment of scars, which were created as a result of acne and pimples, or as a result of burns and other injuries. By using this oil you can eliminate the presence of various forms of eczema on the face, and also herpes, traces of cuts, scratches, etc. In addition to having a beneficial effect in the treatment and nurturing of facial skin, healing St. John's Wort oil has the same effect in the treatment and care of the skin on all other parts of the body. If you decide to nurture your skin and face with St. John's Wort oil, applying it three times a day will be enough. Put in a thin layer of this natural product on your skin. It is very important that a few hours after lubrication with oil you do not expose yourself to sunlight because you can experience unpleasant stains on the skin. This oil is very useful for our hair, because it works in a way that slows down and reduces the excessive greasiness of hair, nourishes the root, and in this way promotes faster growth of new hair. When used for a long time, the hair begins to be more resistant and stronger against the numerous outside influences. Also its lustre increases, it becomes healthy and radiant. Since John's wort oil nourishes and keeps skin cells on the top of his head, and promotes better blood circulation in the region, due to which significantly less hair loss and less frequent occurrence of dandruff was recorded. It is necessary to do this twice a week before washing, first apply St. John's Wort oil on the hair, and in a way that you spread it evenly and rub it in, from the roots to the tips. Wait about half an hour, and then wash your hair. After couple of times you will notice a significant difference. In half a litre of nettle shampoo pour a bottle of AD oil drops, St. John's Wort oil for external use and 100 ml of panthenol. Your hair will completely regenerate if you regularly wash out the shampoo. Be persistent, natural hair cannot grow overnight. It will take some time to notice a visible difference. Medicinal St. John's Wort oil, except for skin and hair can be used in various forms of vaginal infections. St. John's Wort oil in gynecology is used since ancient times. Vaginal infections are the most common gynaecological diseases of women and the most common reason for their visit to a gynaecologist. Some gynaecologists recommend using vaginal suppositories with St. John Wort oil because it has inflammatory and antiseptic effect. They are used mostly for epitalisation of mucous membrane of the cervix. You can use this oil in the home version. All you need are tampons and liquorice oil. It is necessary to apply St. John's Wort oil on a buffer, and then use it. Change the buffer every 2 hours during the day, if you use them at night you can keep them a little longer. To mitigate and cure the symptoms of external infections of mucous membranes, it is quite enough to apply soothing oils of St. John’s wort to the infected region or to put the lining of gauze that you previously soaked in the oil. How to use St. John's Wort oil for haemorrhoids? Follow the same procedure as before, and your painful and inflamed veins will be healed by lubrication or by putting the medicinal lining. In the case of surgical treatment of breast cancer, as well as in the treatment of wounds after surgery, some doctors recommend the use of oil in the process of wound healing. Is it safe to use St. John's Wort oil in pregnancy? It is not recommend to use St. John's wort oil during pregnancy. It may cause skin sensitivity to light, so use the cream for sun protection and do not sunbathe. Check with your doctor before taking any medicine with St. John's wort, because it reacts with many medicines. It may cause an increase in blood pressure when used with the compounds of ephedra. Pregnant women should not drink St. John’s wort tea. St. John's Wort oil is often mistakenly used for sunbathing, but in people sensitive to the sun's rays it can occur photo toxicity and mild degree burns. Another type of products includes tea from this herb, drops or tinctures, which is the accepted official medicine in the treatment of mild or moderate depression. Such compositions exhibits fewer side effects than conventional drugs and in Europe it is widely used. However, it is known that doctors and pharmacists in many European countries pay great attention and warn patients and consumers on its possible interactions with certain groups of drugs. Namely, St. John's wort activates certain liver enzymes involved in the metabolism of the major groups of drugs. This leads to rapid metabolism and excretion of drugs taken simultaneously with preparations of St. John's wort. In this case, doctors often have to increase the therapy, which can cause the same side effects of these drugs! In traditional medicine St. John’s wort oil is prepared in a way that three quarters of the corresponding glass jars or bottles are filled with freshly harvested plant parts. It is then overlaid with olive oil, sunflower or other edible oil of your choice. Then the jar is closed and allowed to stand in the sun for 45 days. Filter it and keep the glass bottles in a dark place. The active ingredients of St. John's wort will give the characteristic red colour to this product. You need to mix the two tablespoons of St. John’s wort and one tablespoon of thistle oil. Then add one egg yolk. Mix everything well and unite it so the mixture is poured with 5 drops of lemon juice and calendula tincture. Apply a thin layer on the stomach, breasts and thighs. Leave it to act for about half an hour, then rinse with lukewarm water. Here is another way to make St. John's oil out of fresh flowers! 100 grams of fresh flowers of St. John's wort. 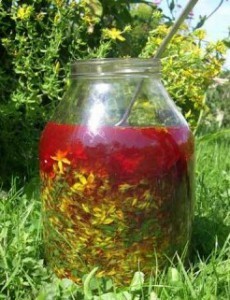 St. John's wort oil is prepared from the fresh flowers. First wash them in cold water and let them sit on a windy place throughout the night. In the morning, put them in a transparent glass jar or bottle and poured over with a litre of olive oil. It is important that the oil covers the surface of flowers. After this put the gauze over the jar and tighten it with a rubber band. That sealed container needs to stand for about 40 days in the sun. After this time has passed, the contents need to be filtered and poured into a glass packaging with hermetic closure. Such obtained St. John's Wort oil should have intense red colour, it shows us that we have properly prepared it, and that it is ready for use. Its healing properties can last up to two years, and that is usually the expiration date. What is St. John's oil price in pharmacies, and where to buy it? To our great luck St. John's Wort oil has a very favourable price. It is easy to get it in any better stocked pharmacy, and even healthy food stores. 30 ml bottle will cost about 5-9 dollars. If you have all of the above problems, try using St. John's Wort oil, you will not regret it. St. John's Wort is a plant for all. The healing properties of St. John's wort were known by the ancient Greeks and Romans and was mostly used in the treatment of skin problems, as well as in the case of animal bites. Even the famous Swiss physician, physicist and alchemist Paracelsus (he lived in the 16th century) recommended this plant for cleaning the blood, and alleviate the pain. St. John's Wort oil can now be purchased online and in stores (via the Internet), web shops and other places. We advise you first inquire about the producer and the product, read comments and experiences of other people with the site such as ours. You can read forums on alternative and natural treatments before reaching for your wallet. When St. John’s worth should not be used? It is known that many of today's products that contain St. John's Wort have a very adverse effect on contraceptives by reducing their effects, and can lead to unwanted pregnancy. More such cases were recorded in the UK. Also, the compositions of St John's wort should not be used with other medications that are applied in the therapy of HIV, because their efficiency decreases rapidly due to the elimination of the drug from the body. Such patients are not recommended to take preparations based on St. John's wort. In addition, an interaction with other photo-sensitive medicines: coumarin-type anticoagulants, Trazadone, sertraline, nefazodone, cyclosporine - digoxin, theophylline and others has been confirmed. If St. John's Wort oil or tea is used simultaneously with conventional antidepressants, in most cases it can cause the so-called. Serotonergic syndrome.